Stonestreet Estate Vineyards is the story of a family's vision to defy the limits of California winegrowing. Jess Stonestreet Jackson and Barbara Banke established the estate in 1995, and their son Christopher Jackson and his wife Ariel continue the legacy -- and the middle name "Stonestreet" has now been passed from father to son for three generations. Stonestreet is one of the most expansive and multi-faceted mountain vineyards in the world and produces a distinctive collection of single vineyard wines -- powerful Cabernet Sauvignon, soulful Chardonnay and electric Sauvignon Blanc. The Jackson family acts as stewards of the land, caring for this 5,500 acre mountain estate that towers high above the Alexander Valley in the Mayacamas Mountain Range. Ranging 400ft to 2,400ft in elevation, the estate showcases a dramatic array of mesoclimates on peaks, valleys and ledges. The geological diversity of the mountain, which contains more soil types than all of France, confers a strong mineral characteristic in the fruit, while the challenges of farming at elevation produce smaller, more concentrated berry clusters. Winemaker Lisa Valtenbergs uses artisanal winemaking practices -- fruit is harvested by hand, Chardonnays undergo native yeast fermentation and Cabernets are fermented in upright French oak tanks to tame tannins -- that ensure the best expression of mountain terroir. The resulting wine is dynamic and intensely flavorful with bold structural integrity and the distinctive flavor profile of the Mayacamas Mountain Range's Black Mountain. 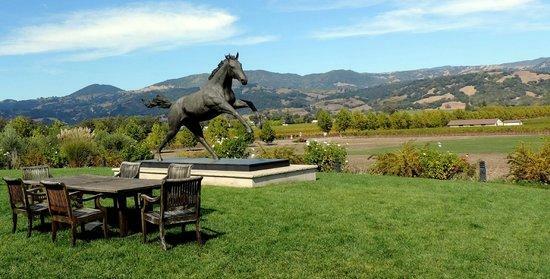 Knowing that it would take more than one generation to understand the complexity of the estate, Jess Jackson notably stated, "Stonestreet has the destiny to be one of the greatest vineyard sites of all time." As the second generation, Christopher and Ariel are building upon that legacy, pushing it forward with an ever-deepening understanding of this awe-inspiring estate. Wine Advocate 94"From the lowest elevation (1,000 feet) vineyard, the 2012 Chardonnay Bear Point reveals lots of orange and apricot marmalade, pineapple and honeysuckle notes along with wonderful acidity and a fresh, lively style. Enjoy it over the next 5-7 years." Wine Enthusiast 97 Cellar Selection "Pretty much as good as any Cabernet out there, if not better, and at a fraction of the price you’ll pay for the “cults.” If there was ever a wine made for the cellar, it’s this one, the antidote for those who consider California Cabernet a simple fruit bomb.